The highlight of Biofach 2018, which is currently underway in New Delhi and concludes on October 27, is an organic golgappa (panipuri) stall put up by an organic company from Jammu. The puris are made of organic floor, the water from organic spices and the other inputs from organic farm products. The stall is being thronged by all including foreign buyers. 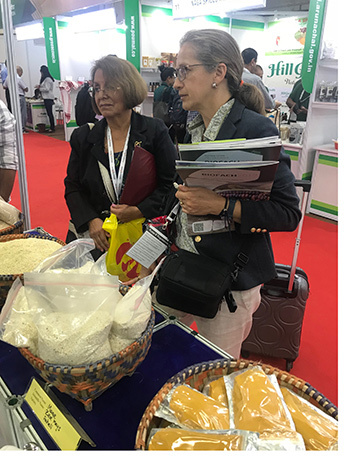 The Agricultural Processed Food Products Export Development Authority (APEDA) has invited 50 buyers from such countries as China, South Korea, Vietnam, Mexico and the European Union (EU). They have evinced keen interest in Indian organic food products, including tea, spices, honey, basmati rice, coffee, cereals, dry fruits, vegetables, processed foods and medicinal plants, millets and even organic golgappas (panipuri), to cater to increasing consumption levels in their own countries. “Apart from showing interest in Indian organic products, the international customers are also interacting with Indian companies and farmers and exchanging information, resources and knowledge about agricultural practices at the event. They have suggested in order to trade globally, the three factors that Indian farmers needed to consider were quality, quantity and price point.” said Paban K Borthakur, chairman, APEDA. “Apart from organic food items, foreign buyers are also showing interest in non-food products, including beauty and health and personal care products. The major demand under the organic product category is for flax seeds, sesame and soybean; for pulses such as arhar (red gram) and chana (pigeon pea), and rice, besides tea and medicinal plants. APEDA soon plans bring textiles under the organic umbrella for exports. At present, cotton is covered under organics,” he added. “People around the globe are getting more conscious of what they are eating. They are switching to organic products, as they do not want chemicals in their food. Compared to the overall agriculture exports, the share of organic products is less,” Borthakur said. “We are impressed by India's organic farming, and in Vietnam, we have also started organic farming and were in talks for the import of grapes, millet and tea,” said Tran Kim Long, director general, ministry of agriculture and rural development, Vietnam, who is heading a buyer’s delegation in India. The major demands under the organic product category are for oil seeds, cereals and millets, sugar, fruit juice concentrates, tea, spices, pulses, dry fruits, medicinal plant products, etc. Though the United States, European Union (EU) member countries and Canada were the biggest buyers of organic products, many new countries like Israel, Vietnam and Mexico have also begun taking interest lately. The equivalency granted by the European Commission and Switzerland for unprocessed plant products and the conformity assessment granted by the United States Department of Agriculture (USDA) has played a pivotal role in increased exports to these countries. The major highlight of Biofach was the display of organic products from the North-Eastern states, which are coming up as the hubs for Indian organic farm products. A variety of organic crops from these states are on display. These include tea, Joha rice and lemon from Assam, large cardamom and ginger from Sikkim, king chillis from Manipur, sugarcane, cowpea and paddy from Mizoram, passion fruit from Meghalaya and pineapples from Tripura.